There’s a longstanding joke that videogame heroes are mass murderers, laying waste to hundreds of enemies in a matter of hours. The Last of Us, from developer Naughty Dog, provides a context for its serial homicide. As lead characters Joel and Ellie become proficient murderers, killing becomes as natural and as necessary as breathing, but these heroes take every kill to heart. Over time, these acts take their toll, and not as a high score flashing at the top of the screen. Expertly crafted with themes of loss, survival, and moral ambiguity, The Last of Us engrosses the player in a story of squelched humanity. A mysterious fungal disease has infected more than half the world’s population while the remaining humans butcher one another for control of supplies and territory. As an adept enforcer, you are called upon to smuggle a girl west in exchange for a sizable stash of weaponry. The story may sound familiar and largely predictable to most zombie fiction lovers, but it’s told with such brutality and haunting grace that it will easily be remembered as one of the best gaming tales of this console generation. The narrative feels like the culmination of Naughty Dog’s experience from working on the Uncharted series. Characters are allowed to develop and reveal themselves through thoughtful, quiet moments scattered in between intense encounters. 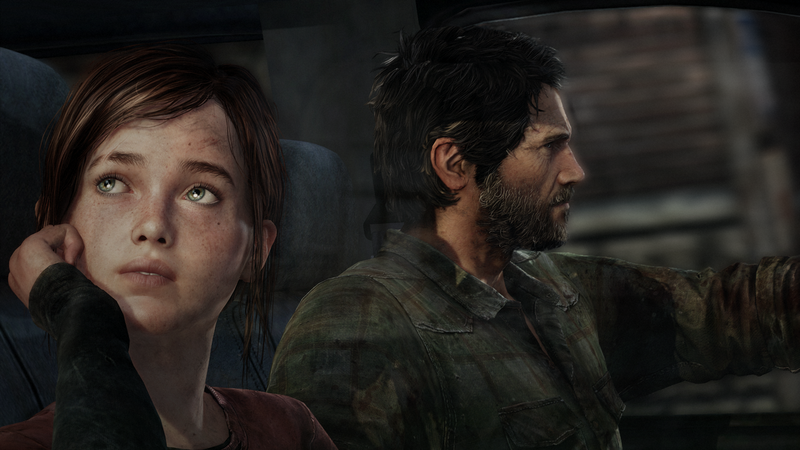 These moments build a strong rapport between the characters as well as the player; you feel as if you’ve been surviving alongside Joel and Ellie for months, learning their subtle quirks and mannerisms. It’s an intriguing balance of painful desperation and genuine tenderness that the game strikes perfectly, giving the characters a believable presence in a world that is literally eating itself alive. The voice-over performances and minimalist melodies are transcendent, adding just the right amount of dour with shades of stoic optimism. Rounding out the game’s stellar presentation is its trademark Naughty Dog look. 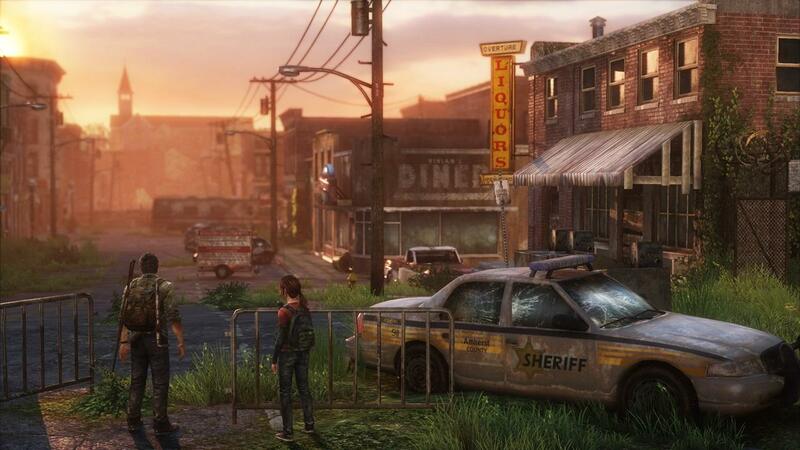 The Last of Us has gorgeous scenery along with impressive articulation in the faces and animations due to full-body motion capturing suits the actors wore as they performed. It’s hard to imagine why more studios don’t incorporate this technique instead of relying on archaic stock figures with a handful of poses. The game does have its share of graphical hiccups. The framerate falls drastically whenever more than three enemies rush into view, turning some panic-inducing moments into jittery slideshows. The occasional body part also clips through walls, especially during the crouch animation. The settings are intricately designed for obsessive exploration and scavenging. Parts used to build med kits, “shivs,” and other tools are placed logically throughout the destroyed world. If an item doesn’t shine; however, you are unable to interact with it. It’s frustrating to see items that could be helpful to Joel littering the area only to go unused. If a flimsy door or window is blocking your path, no amount of explosives or bladed pipe swings will break it down. It would be impossible from a technical standpoint to allow you to pick up everything and venture everywhere in sight, but it betrays the startling realism the game works so hard to convey, becoming more apparent that you are, indeed, playing a game. As you make your way across the devastated countryside, the game presents you with three routes for most combat situations: shooting your way out, stealth take-downs, or running away. Successful players will blend all three to survive while managing a hefty inventory of supplies. Most of your time will be spent crouching and using the game’s listening mechanic to see sound through walls. It’s an effective way to deal with oblivious infected and track the patterns of scavenger patrols without cluttering the screen with overhead mini-maps or cones of vision protruding from enemies. The shooting in The Last of Us is astoundingly accurate to real-life shooting. Your arm sways when you aim and it takes a considerable effort to reload. It’s a novel aspect at first, but it makes for firefights that are more difficult than they should be. It’s still satisfying to dispatch a raider or creature with a single, well-placed shot, but enemies eventually start to absorb an unthinkable level of munitions. Pills are used to purchase upgrades to your listening distance, crafting speed, and aiming, but these upgrades are few and expensive. Most characters will be unable to max out their survival skills during their first play through, although these upgrades carry over into a “new game plus” mode after a successful first run-through of the game. Another way to upgrade is to spend salvage on your weaponry–improving reload speed, damage, and reducing recoil; however, you will not be able to build your own custom Joel. The game requires a specific “wrench level” for certain upgrades—meaning you can have all the salvage imaginable, but you can’t upgrade your shotgun’s damage until you collect 4 wrenches. Seeing as how there are a total of 5 wrenches in the entire game, Joel won’t be mastering his favorite weapon early, nor can he be customized in any interesting way that gives the player authorship of their experience. Stealth kills are ideal for their potency and low supply cost, but they can go bad quickly. There isn’t a separate button that snaps into cover. Your movement gestures you into a covered position, but you never feel like it’s working correctly. Collision detection is spotty at times, turning what should have been a silent strangle into an awkward exchange of fists and gun blasts. The absence of a “hide dead body” mechanic also feels like a strange omission considering the game relies heavily on outmaneuvering your pursuers. Support characters behave erratically, walking in front of you while you’re trying to line up a shot or bumping you out of cover as they squeeze past. Because most of the game is spent hiding, your ally running out into the open during what is supposed to be a tense manhunt kills the mood. Thankfully, the poor enemy AI doesn’t register allies when searching for you. The AI also has a bad habit of making enemies dart back and forth when it doesn’t know whether to flank you or attack head on. Despite these shortcomings, Ellie can be useful from time to time when she lobs bricks at people’s faces or brings you a much needed med kit. When the gameplay comes together the way it should, The Last of Us is breathtaking. Unfortunately, it rarely reaches that form consistently. By the third act of the game, combat feels like a stiff slog from checkpoint to checkpoint. It’s a testament to the game’s wonderful narrative that most will continue playing just to see what will happen next to Joel and Ellie. The game is best played as a tourist, experiencing the gritty horror as interactive fiction. It’s bittersweet that this game will be one of the last big titles for the PS3 when so much of its gameplay could have thrived on the PS4 hardware. A sequel that can produce a game that matches the strength of its narrative is an exciting prospect. Until that game gets made, we’ll have to pass the time soaking up the nuances of an incredibly rich and engrossing nightmare.